This deal is a very hot seller. LivingSocial has already sold over 2,000+ vouchers at the time of this post. Soothing scalp massages, hot-towel treatments, continental champagne breakfasts—these are luxuries that William Halabi treats guests to at Chrome Spa Salon. There, his staff of top-tier stylists doles out lavish spa treatments and advanced haircare, keeping one eye on continuously shifting trends, one eye on classic style, and their third eye on the future of the universe. The stylists are particularly skilled at colouring hair in uncommon shades, transforming ordinary locks with flirty hot-pink tips and dazzling streaks of purple. Aestheticians, on the other hand, smooth skin with facial services, mani-pedis, and waxing. While the amenities punctuate Chrome Spa Salon’s experience, the studio itself creates an atmosphere of refinement. Lively music bounces off milk-white walls accented with large swaths seemingly coated in sultry lipstick. Modern photography and artwork explore a Da Vincian aesthetic, hovering above jet-black couches and chairs. 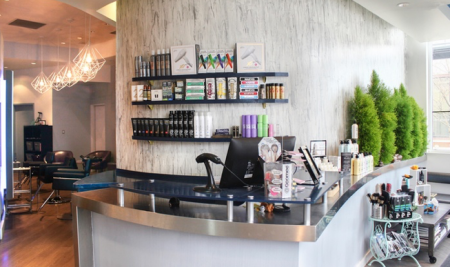 By the front desk, a sweeping display showcases the advanced products the salon infuses its services with, from Dermalogica to Schwarzkopf Professional. Promotional value expires 120 days after purchase. Amount paid never expires. Not valid with William, Nikki, or Brittany. Additional fee for upgraded Balayage services or additional highlights. Longer/more difficult hair subject to extra charge. Appointment required. Additional fees may apply depending on hair length, texture, and density. Limit 1 per person, may buy 2 additional as gift(s). Valid only for option purchased. Not valid for clients active within the past 12 month(s). Limit 1 per visit. Valid only with select stylists. 24-hour cancellation notice required. Merchant is solely responsible to purchasers for the care and quality of the advertised goods and services.